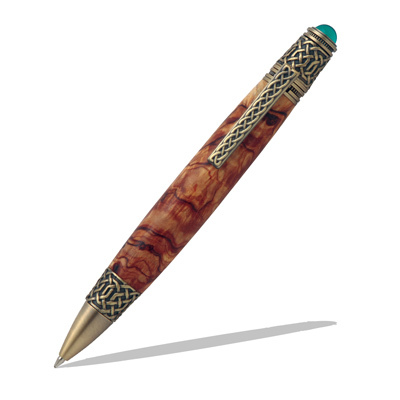 With 50 to 60 million proud Americans of Celtic descent, this pen will be an eagerly awaited gift honoring their heritage, pride, courage and values. 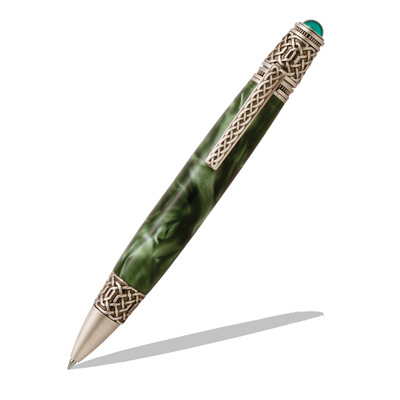 The pen features intricate Celtic Knot scroll work on the tip, clip and end as well as an emerald color cabochon on the end. The Celtic Knot motif dates back to 5th century and represents the truth of eternity and interconnected spirit. Your gift recipient doesn't need to be of Celtic origin to appreciate this pen; the symbolism of Celtic culture is universal. The rustic, authentic look of this antique brass will pair beautifully with any wood blank. We've taken quality solid brass components with brass plating and chemically darkened it to simulate aged brass, which results in a gorgeous, long lasting brown plating with golden undertones. Will also pair beautifully with any green plastic blank to compliment the Celtic theme.